IMC Toys has provided me with this Cry Babies Magic Tears Coney Doll in exchange for an honest review. "Meet Coney, she is so sweet! She loves baking cakes and treats for all of her friends. She’s so talented her cakes come in all shapes and flavours. She's so cute!" 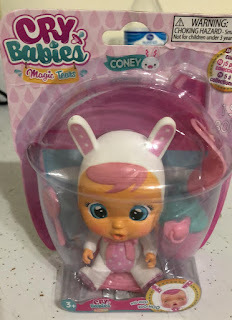 You can watch the webisodes about Coney and the other Cry Babies on youtube. Coney is sweet, sensitive and optimistic. She loves to bake cakes and biscuits. Her favorite is strawberry and cream cake. She has a pet rabbit and is allergic to dogs. Everything in her house is pink. Her role in the Cry Babies group is that she always sees the positive side of things. This little doll comes with a bib, a chair, a bottle, a pacifier and a lollipop. Give it a drink from the bottle, then put the pacifier in her mouth. If you squeeze her tummy after you give her a drink, she will cry tears from her eyes. There are 5 other dolls in this series to collect, so look for them all.